Efforts to build a ballyard at the Wells High School parking lot scored a pledge of $100,000 to $200,000 from the Cal Ripken Sr. Foundation, says Wells principal Ernesto Matias. The charity named for the Baltimore Orioles catcher and manager will help design the park, make fundraising connections and try to cut costs of a project estimated at upwards of $2.5 million. The Ripken Foundation has developed youth ballparks in Florida, Massachusetts, Maryland, Pennsylvania, Texas and Virginia. The Field of Hope plans would place home plate roughly where the drivers-education Willis wagon is parked. The school at 936 N. Ashland Ave. now uses Eckhart Park's soccer and baseball fields a half-mile away at 1330 W. Chicago Ave. 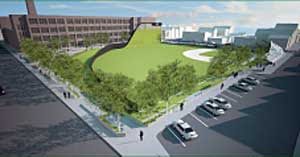 The preliminary design incorporates a dog park, playground and movie screen. The Field of Hope Foundation's November event at the Boundary raised $5,000. The fundraising group is looking for more board members: Candidates should contact Matias or Susan Nusbaum at the school.